​ Mark Meadows, leader of the Freedom Caucus, offered a deal to Ryan and Trump, whereby the Freedom Caucus would largely support the bill. In perhaps his worst mistaken tweet, this morning President Donald Trump declared war against the conservative core of the House of Representatives. The Tea Party movement ushered in the most stridently fiscal conservative coalition in decades. The current voice of that outcry for fiscal responsibility and economic freedom is known of as The Freedom Caucus. Jim Jordan and Mark Meadows have served as spokesmen for the group. About half of them (including Oklahoma's Jim Bridenstine) supported the House bill to replace the ACA (ObamaCare) with a phase-out plan which also put a stop to funding Planned Parenthood. The other half insisted on staying with a clean repeal bill which the whole republican Caucus supported just a year ago. Jim Bridenstine has been a heroic supporter of Trump's candidacy, especially in the October revelation of the Billie Bush Access Hollywood 'hot mic' chatter. Bridenstine went before CNN "firing squads' to declare that the Supreme Court hangs in the balance, and thus Hillary Clinton must be kept out of office despite the vulgar chat of years ago. The Federal govt. statistics show a shocking continuation of trends in the cost of goods and service. Jonathan Small, of the Oklahoma Council of Public Affairs has released this graph of the various components in family household expenses. the stark reality is that the areas receiving the most govt. subsidies, are seeing the prices rise rather than stabilize or fall. The research comes from American Enterprise Institute. Equally noted is that the areas where trade is freely happening and competition is intense, is producing the best innovations and prices are actually dropping. For the past 7 years, the Obama administration has heavily subsidized the college industry, leading to the most astronomical cost increases and lifetime debt to many alumni. Healthcare costs have skyrocketed in the Obamacare years as demand went artificially high from people casting off prudent discretion because "someone else is paying the bill (insurance). Food prices jumped as the govt. subsidized ethanol, leading farmers to divert grain production toward that subsidized alternative energy. Global free trade has helped drop the inflation rate because new labor forces are competing to lower the labor component in production. ​ Read more at the American Enterprise Institute's Carpe Diem blog. This morning, Congressman Jim Bridenstine told radio listeners and radio host Pat Campbell that he is willing to co-sponsor the Mo Brooks one-sentence ObamaCare Repeal Bill. When the white house heard of the renewed resolve, they sent Trump's senior advisor, Steven Bannon. Perhaps this is just a strategic move by Bridenstine, to shame his colleagues to a return to the table. There is an active effort to use the discharge petition to force the House to register a vote on a clean repeal bill. "WASHINGTON — House Republican leaders and the White House, under extreme pressure from conservative activists, have restarted negotiations on legislation to repeal the Affordable Care Act, with House leaders declaring that Democrats were celebrating the law’s survival prematurely." As the legislature continues their junior high games, the courts play gotcha, and the governor has completely lost touch with her subjects; the anger of the commoners is reaching a boiling point. We are ready to gather and occupy. There are good people working the halls of the legislature. There are dedicated and humane state workers. There are commoners with more sense than the bosses who run this state. We stand by while you do nothing about the pirates with badges who shake down travelers, confiscating booty with the claim that "it coulda come from selling drugs". Liberty is a principle deeply engrained in the gospel message, but the folks who bear the title of "Honorable" seem to have forgotten it. We are a people yearning to live free. We want the oppressors of the state off our backs. We are willing to endure some danger from our neighbors in exchange for that precious liberty. We are sick of the nanny state telling us what is good for us and ruining our lives under the pretense of saving us from ourselves. Our lawmakers have brought us shame. But there remains little that will restore that former trust until the politicians quit playing their little power trips, manipulating the system, and start letting representative democracy take it's course. Jefferson and Adams almost quit their effort to write a declaration of independence, because each wanted his own terms. "In politics, you almost never get 100% of what you want. Fiscal conservatives do their cause a disservice when they fail to accept incremental progress. They do their constituents a disservice when they indoctrinate them with the notion that reaching a compromise on legislation means compromising principles or a some sort of abject failure of leadership. That is not how our Founders governed. Jefferson and Madison neither one got everything they wanted in shaping our government. They reached consensus. Side bar suggestion: phrases like "spreading another half truth" and "peddling their lies" doesn't usually lead to productive dialogue. It's just hyperbole. I'm with you on demanding a smaller govt that is a better steward of taxpayer dollars. But you have to be willing to play ball and actually legislate and not just say "No" when you don't get 100% of your wish list." Attorney Jared Snider is an Oklahoma native, living & working in Oklahoma City, along with his wife and their children. 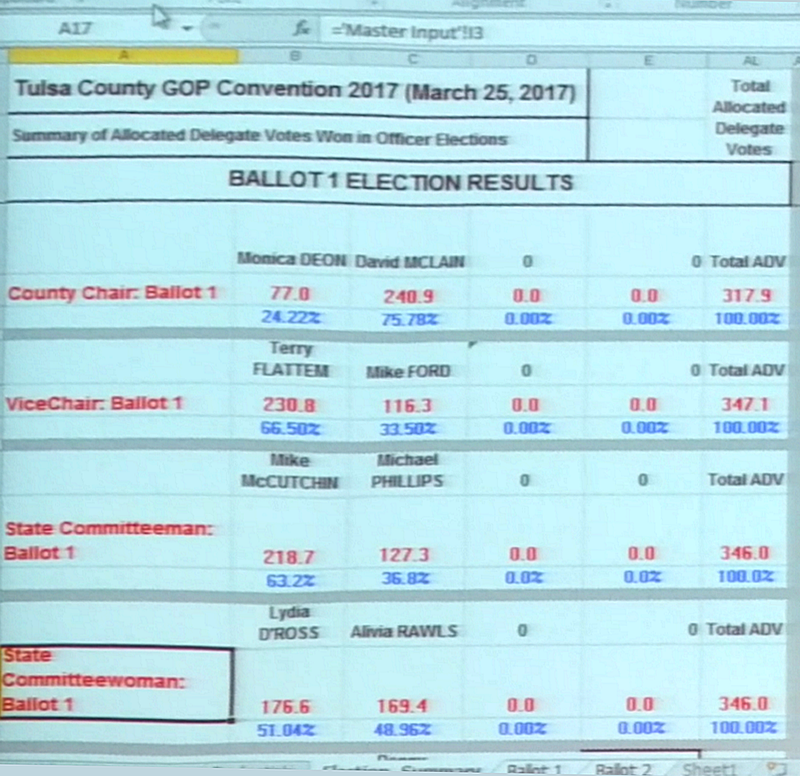 Tulsa businessman, David McLain, was the overwhelming choice of the Tulsa Republican delegates, at the county convention, today, at Jenks High School. Incumbent Donny Tiemann was overwhelmingly selected to represent the county party at the 1st District committee. Tulsa Sheriff; "We Will Appeal Williams Judgment"
Sheriff Vic Regalado told a grassroots Civic group that his legal team will seek an appeal of a jury verdict which awarded the Williams estate a $10 million judgment for wrongful death. Regalado told The Tulsa 912 Project members that the medical provider was responsible. I asked if another separate suit will be likely with the TCSO as the plaintiff, seeking damages from the old medical contractor, which lost the jail contract in the wake of the Williams tragedy. ​Regalado said, that is in the works, as well. Tulsa Republicans have a clear choice for the future leadership of the party. The publisher of SoonerPolitics strongly endorses David McLain and Terry Flattem. While the political candidates and elected officials face difficult decisions in municipal, county, state, and national issues; the party must be thriving with openness, resolute principles, and cooperative energy. That has been desperately missing at the county GOP. David McLain is a former senatorial candidate and local businessman. He pastors a congregation in northern Tulsa County. Terry Flattem is an enthusiastic party volunteer at the headquarters who is dedicated to assisting party members and candidates. A veteran and retired IT specialist, Flattem possesses the skill and experience in managing the operations at the party headquarters. The former chairman (Mike Ford) punished and exiled some of the most effective precinct organizers and lied repeatedly about his campaign promise to hold County Committee meetings quarterly. He failed to provide on-demand organizational information to precinct members seeking to better communicate with each other for the sake of the party. Ford does not deserve any party leadership in the county. Tonight, the Tulsa Area Republican Assemblies held a Convention Preview just days ahead of the Saturday County Convention. Every elective office in the party appears to be up for grabs. All the current office holders are so far indicating that they are not seeking to keep their office. Allen Branch also indicated his intention to run for County Chair, but said he would support McLain if he is unsuccessful. Both candidates specifically pledged to open the county resources for the sake of precinct development. It was one of the most controversial policies that retiring chairman Mike Ford has instituted. It led to the lowest turnout of precinct meeting participants since before Dewey Bartlett Sr. was governor. County Jails are for dangerous people. That's why it's a terrible solution for seriously ill people. Elliot Williams was a fine American man. He served in our military and stayed out of trouble. He was a devoted father. His family was just awarded a $10 million dollar judgment for perhaps the cruelest torture ever applied to an Oklahoman. He got sick, and he got punished severely for it. Unlike other illnesses, his brain got sick. Diabetes is an imbalance of the pancreas. Folks take meds to correct that, and they get well. But when the brain chemistry gets imbalanced, it impacts all neurological functions, including behavior, mood, and even our sense of reality. Williams displayed severe symptoms. When that made him unmanagable, his family moved him to a local hotel. ​ The Tulsa Center for Behavioral Health is a local state-run mental health facility designed for situations like this, but the State Commissioner of Mental Health, Terry White, severely scaled back operations and the facility is perpetually full. Law enforcement often doesn't even ask them if there is an opening. The House today voted to pass the Jon Echols 'Real ID' compromise bill (HB1465). It advanced on nearly a straight party line vote. What we begin to see is a Democrat party trying one more time to evoke a parliamentary 'hunger strike'. they refuse to support Republican measures of any type unless and until there is a vote to hike oil production taxes. Never mind that a few weeks ago the Republicans largely supported Dem. Eric Proctor's school lunch bill. But this hunger strike is not translating to committee deliberations. The Democrats and Republicans are deeply engaged in productive work in the various committees where the bills take final shape. One example is the Echols Real ID bill where the 3 Democrats all approved the sensible Republican compromise version. But then, these 3 Democrats of the Rules Committee(Steve Kouplen, Meloyde Blancett, David Perryman) today voted 'Nay' to the same proposal. It's worth noting that Dem. Donny Condit of McAlester did cross over to support the measure. He's the same honorable man whom Republican chairman Paul Wesselhoft trusted so much that Condit was appointed Vice Chair of the Elections & Ethics Committee for the past 2 years. UPDATE: Rep. Kevin McDugle picked up the phone and called me when this article first posted. We agree that his effort is well intended and it's personal with him. Rep. McDugle is a recovered victim of child molestation. But I shared with him my concerns for the elderly and affluent getting "shaken down" for out-of-court settlements. It is my hope that an ammendment is offered, to adjust the date to a plaintiff's 30th birthday, rather than 45. It will still help the victims get relief, but would not encourage the Gloria Alreds of the world to set up "shake down" operations in the state. Child molestation is a serious harm to a child's mental health. It is associated with Borderline Personality Disorder and a common experience of people cunfused about their sexual orientation. PTSD is a common diagnosis stemming from repeat molestation. Representatives Kevin McDugle and Carol Bush along with Sen. David Holt, have two bills nearing a floor vote, this week. (HB1468, HB1470) They are a lawyer's dream. The two freshmen legislators teamed up to provide a proposed statute giving lawyers and plaintiffs up to 40+ years to file a lawsuit claiming, among other things, certain emotional damages suffered in childhood. ​ The intention was to give children who suffer sexual abuse a longer period of time to file claims, both criminal complaints and civil damages. One of the longest spans is for claims including indecent proposals. Two freshmen legislators are seeking to raise that span to perhaps 40 years. I have serious concerns for what this could do to exploit elderly defendants and where facts can no longer be certified, leading to a miscarriage of justice. ​This can be devastating for organizations trying to recruit volunteer leaders. The Boy Scouts already have the strictest standards and have a desperate time getting dads to volunteer. I doubt that I would want to subject myself to this 40-year time bomb. Sadly, though, this bill would be a retroactive open season on the elderly who have no way of assembling a defense to some thrapist-assisted "memory" from countless mentally unstable people who may just be looking for a cash-cow and waiting until an older adult has stockpiled a full retirement nest egg. California is a Lawyers heaven. Attorney Gloria Alred may open an Oklahoma Office, if legislation passes. Tulsa - I've been very busy the past few weeks. As well as being an activist and journalist, I am an advocate for a better public policy on mental illness. It is a huge issue with massive needs. But we measure success in baby steps. The Tulsa County Jail's new mental health unit is one of those baby steps. As a member of NAMI Tulsa, I reached out to Sheriff Regalado and his medical staff(Turnkey) about the matter and we offered help. They finally completed the state-of-the-art mental health pods and the new medical services contractor has set up operations. Richardo Vaca is the lead detention officer for the mental health unit. Former interim sheriff, Michelle Robinette is the new director of mental health. They asked our trained intructors to assist them in training their new cadets and select current officers in a program called Crisis Intervention Training. We currently provide this help to various law enforcement personel, statewide. But detention officers rarely recieve this insightful instruction. A big part of what we provide is insight after-the-fact from individuals and their family members, about what went wrong(or right) during their psychotic break. We talk openly about the PTSD caused by law enforcement conflict during a mental meltdown, and how to safely avoid injury or death; and how to speed up recovery through proactive measures. Former interim Tulsa County Sheriff, Michelle Robinette, welcomes Cathy Costello to a tour of the new mental health pods. Costello's son is mentally ill and currently incarcerated at another Oklahoma facility.